With a choice of on-location slaughter using the Mobile Abattoir or off-site abattoir processing, things have never been easier. The Mobile Abattoir service can be booked using the form below, and the order forms for beef, pork and lamb are also online so you can specify the cuts you would like from each animal. Our on the farm service truck is well equipped for sheep, cattle and pigs. We will slaughter on location and then provide transport back to the butchery chiller for further processing. • You will be contacted when our truck will be in your area. • Please leave your animal in a stress free environment. Cattle are best kept with other stress free animals, stressed animals produce tougher meat and will be of poorer quality than stressed free animals. • Please have your animal in an area that is easy accessible by the truck. Our truck is quite high and heavy and it can get stuck in the wetter months and low hanging trees can cause problems. • Please notify us and the onsite slaughterman to put aside tongue, tails, livers etc. • Offal removal can be arranged at an extra cost, however if you have a trailer, tractor or large sacks the remains can be put in these for you for easy disposal. • Book your animal with us and we will organise with the Abattoirs a drop off date and time. • You will have to organise cartage of your animal to Ashburton Abattoirs, located on Bridge Street, Ashburton. 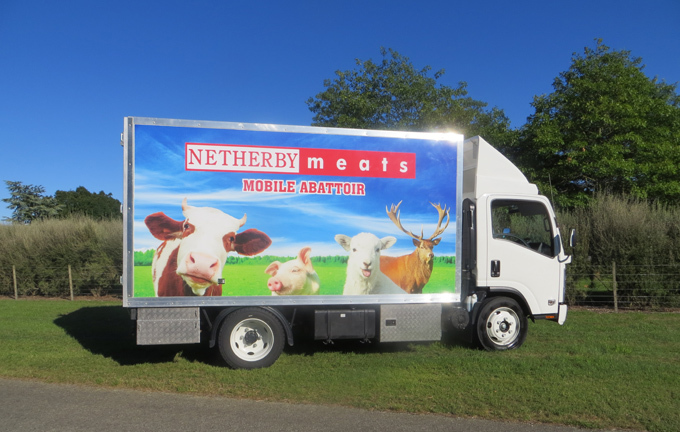 To arrange for the mobile abattoir to visit your farm, please fill out the form below. HOMEKILL ONLY: I declare that I am the owner of the stock described above and have been actively involved in the day to day maintenance of the animal, including providing for the physical health and behavioural needs if the animal for at least 28 days. Please prove you are human by completing the CAPTCHA test.